Confederate States of America. Post-Office Dept. Instructions to Post Masters. (cover) Instructions to Post Masters. Confederate States of America, Post Office Department. PRINTED BY RITCHIE & DUNNAVANT. SIR,--The following laws, enacted by the Congress of the Confederate States, are transmitted to you for your guidance in the discharge of your duties as Post Master. To prescribe the Rates of Postage in the Confederate States of America, and for other purposes. cents; and for any distance exceeding five hundred miles, double that rate; and every letter or parcel not exceeding half an ounce in weight shall be deemed a single letter, and every additional weight of half an ounce, or additional weight of less than half an ounce, shall be charged with additional single postage; and all packages containing other than printed or written matter--and money packages are included in this class--shall be rated by weight as letters are rated, and shall be charged the rates of postage on letters ; and all drop letters, or letters placed in any post office not for transmission, but for delivery only, shall be charged with postage at the rate of two cents each; and in all the foregoing cases the postage must be prepaid by stamps; and all letters which shall hereafter be advertised as remaining over or uncalled for in any post office, shall be charged with two cents each in addition to the regular postage, both to be accounted for as other postages of this Confederacy. Postage on Newspapers, Pamphlets, and other printed matter, including Books. charged with postage as follows, viz: The postage on the regular numbers of a newspaper published weekly, shall be ten cents per quarter; papers published semi-weekly, double that amount; papers published thrice a -week, treble that amount; papers published six times a week, six times that amount, and papers published daily, seven times that amount. And on newspapers weighing more than three ounces, there shall be charged on each additional ounce in addition to the forgoing rates, on those published once a week, five cents per ounce, or fraction of an ounce, per quarter; on those published twice times a week, ten cents per ounce per quarter; and on those published three times a week, fifteen cents per ounce per quarter; on those published six times a week, thirty cents per ounce per quarter; and on those published daily, thirty-five cents per ounce per quarter. And periodicals published oftener than semi-monthly shall be charged as newspapers. if published semi-monthly, double that amount. And periodicals published quarterly or bi-monthly, shall be charged two cents an ounce; and regular subscribers to newspapers and periodicals shall be required to pay one quarter's postage thereon in advance, at the office of delivery, unless paid at the office where published. And there shall be charged upon every other newspaper, and each circular not scaled, handbill, engraving, pamphlet, periodical and magazine, which shall be unconnected with any manuscript or written matter, and not exceeding three ounces in weight, and published within the Confederate States, two cents; and for each additional ounce, or fraction of an ounce, two cents additional ; and in all cases the postage shall be pre-paid by stamps or otherwise, as the Post Master General shall direct. And books, bound or unbound, not weighing over four pounds, shall be deemed mailable matter, and shall be charged with postage, to be pre-paid by stamps or otherwise, as the Post Master General shall direct, at two cents an ounce for any distance. And upon all newspapers, periodicals and books, as aforesaid, published beyond the limits of the Confederate States, there shall be charged postage at double the foregoing specified rates. The publishers of newspapers or periodicals within the Confederate States may send and receive to and from each other, from their respective offices of publication, one copy of each publication, free of postage. All newspapers, unsealed circulars, or other unsealed printed transient matter, placed in any post office, not for transmission, but for delivery only, shall be charged postage at the rate of one cent each. further, The several deputy post masters throughout the Confederate States shall be and hereby are authorized to send through the mail, free of postage, all letters and packages which it may be their duty or they may have occasion to transmit to any person or place, and which shall relate exclusively to the business of their respective offices or to the business of the Post Office Department; but, in every such case, the deputy post master sending any such letter or package shall indorse thereon, over his own signature, the words "Post Office Business." And for any and every such indorsement falsely made, the person making the same shall forfeit and pay three hundred dollars. Payment of Postage in Money until Postage Stamps and Stamped Envelopes are provided. SECTION 1. The Congress of the Confederate States of America do enact, That until postage stamps and stamped envelopes can be procured and distributed, the Post Master General may order the postage of the Confederacy to be prepaid in money, under such rules and regulations as he may adopt. Repeal of the Letter Registration System. an act entitled 'An act to reduce and modify the rates of postage in the United States, and for other purposes, passed March third, eighteen hundred and fifty-one,'" approved March 3d, 1855 whereby the letter registration system was established, be and is hereby repealed from and after the day when this act goes into effect. Conveyance of Mail Matter by Express and other Chartered Companies. be mailed, then the matter so carried shall be prepaid at the same rate that the existing law requires it to be paid from the point where it may be received by such company to the point of its destination, and the post master, where such company may mail the same, shall deface the stamps upon the same. SEC. 6. Be it further enacted, That each agent of any company who may carry letters under the provisions of this act, shall be required to take an oath that he will faithfully comply with the law of the Confederate States relating to the carrying of letters or other mail matter and obliterating postage stamps, which oath may be administered by any justice of the peace, and shall be in writing, and signed by such agent or messenger, and filed in the Post Office Department. SECTION 1. The Congress of the Confederate States of America do enact, That all letters and other matter authorized by law to be transmitted through the mails, written or sent by any officer, musician or private of the army engaged in the actual service of the Confederate States, may be transmitted through the mails to any other place in the Confederate States without pre-payment of postage, but leaving such postage to be collected upon the delivery of such letters or other matter: Provided, nevertheless, That in all such cases the letters and other mail matter so sent shall be endorsed with the name, and shall be on account of the individual sending the same, and shall contain a description of the party who sends the same, by endorsement of his military title, if an officer, or of the company and regiment to which he belongs, if a musician or private. lawfully removed, shall be forwarded to the person to whom directed, at the post office nearest which he may have been removed, free of additional postage. SECTION 3. That on letters transmitted by a member of Congress, with his official signature endorsed on the same, pre-payment of postage shall not be required, but the same may be paid on the delivery of the letters thus transmitted. SECTION 4. Any person attempting to violate the provisions of this act shall be guilty of a misdemeanor, and shall forfeit and pay the sum of twenty dollars, to be recovered before any justice of the peace having cognizance thereof. The Congress of the Confederate States of America do enact, That all mailable matter addressed to officers of the several State Governments, for the payment of the postage on which the said governments are responsible, in the adjustment of the accounts of the parties mailing the same, may be transmitted through the mails without the pre-payment of postage thereon: Provided, That the person mailing the same shall endorse thereon his official title and the nature of the matter mailed; and the postage thereon shall be collected of the said governments at the office of delivery. SECTION 1. The Congress of the Confederate States of America do enact, That so soon as the Post Master General shall procure postage stamps and stamped envelopes, that the Post Masters throughout the Confederate States be required to receive the treasury notes of the Confederate States at par, for said stamps and stamped envelopes, in all cases where the amount of stamps or stamped envelopes applied for shall be five dollars or other sums for which the Confederate treasury notes are issued. SECTION 2. Be it further enacted, That the endorsement by a member of Congress of his name on newspapers or other printed matter sent by him through the mail, shall not, by reason of such endorsement, subject him to letter or other increase of postage. SECTION 1. The Congress of the Confederate States of America do enact, That persons engaged as dealers in newspapers and periodicals may receive by mail any quantity of such papers and periodicals as they may order, on the payment, at the place of delivery, of the same rate of postage as is required by the existing law, to be paid by the regular subscribers to such newspapers or periodicals. SECTION 2. It shall be lawful for persons engaged in buying and selling newspapers and periodicals, to carry any quantity of such papers and periodicals over the post-roads of the Confederate States, outside of the mail, upon prepaying the postage at the same rate charged to regular subscribers to such papers and periodicals into the post, office nearest the place of publication or purchase thereof; and such pre-payment shall be indicated by the stamp of such post office, or by writing upon each paper so sent. SECTION 3. Any person violating the provisions of this act shall forfeit and pay the sum of fifty dollars, to be recovered by action of debt in the name and for the use of the Confederate States. To continue in force certain laws of the United States of America. Be it enacted by the Confederate States of America in Congress assembled, That all the laws of the United States of America, in force and in use in the Confederate States of America on the first day of November last, and not inconsistent with the Constitution of the Confederate States, be and the same are hereby continued in force until altered or repealed by the Congress. Post Masters' returns must be made to close on the 31st March, the 30th June, the 30th September and the 31st December in each year. Post Masters who have not yet reported their names, with the name of their offices, county and State, and the number of the route on which their office is located, in order to enable this Department to forward to them their appointments, will do so immediately, otherwise their offices will have to be discontinued. Post Masters are requested not to write on more than one subject in the same letter. Everything relating to the arrangement of the mail service, placing the same under contract, all correspondence respecting the frequency of the trips, mode of conveyance, mail proposals, or of changing the service, should be addressed to the Chief of the Contract Bureau. of instructions to Post Masters, furnishing marking and rating stamps, providing blanks and stationery for the use of the Department, &c., should be addressed to the Chief of the Appointment Bureau. The supervision and management of the financial business of the Department, embracing accounts with the draft offices, the issuing of warrants and drafts in payment of balances reported by the Auditor, the superintendence of the rendition by the Post Masters of their quarterly returns, is under the control of the Finance Bureau. It has also charge of the dead letters, of the issuing of postage stamps and stamped envelopes, and the accounts connected therewith. To the Inspection Office is assigned the duty of receiving and examining the registers of the arrivals and departures of the mails, certificates of the service of Route Agents and report of mail failures, noticing the delinquencies of contractors, attending to all mail depredations, furnishing blanks for mail registers and mail failures, furnishing and sending out of mail bags, mail locks and keys. Paid Quarterly in Advance, ON NEWSPAPERS, Sent to Actual Subscribers. 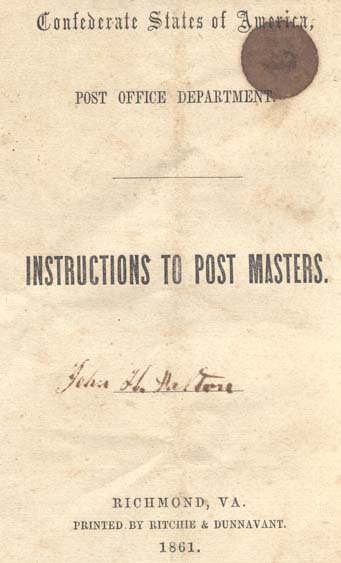 Return to Menu Page for Instructions to Post Masters by Confederate States of America. Post-Office Dept.